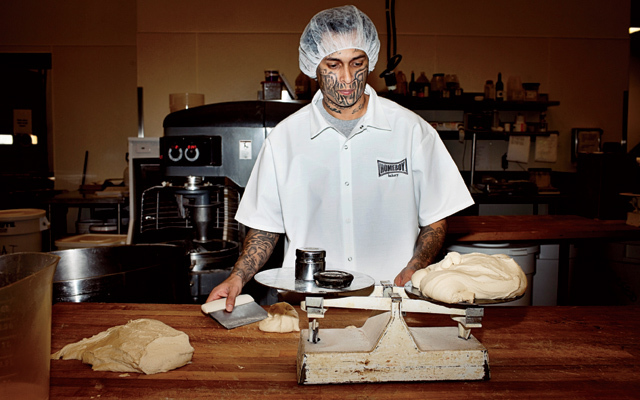 Homeboy Industries, the passion project of an L.A. priest, has brought life reboots to hundreds of ex-cons, including onetime gang members and the former CEO of mega-construction company KB Home. 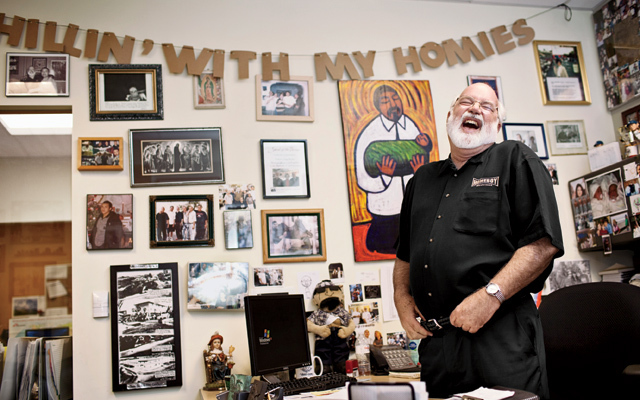 last summer, just after Mass, Father Gregory Boyle took a drive through Boyle Heights, the East Los Angeles neighborhood where he has lived for 26 years. That they share a name, the priest and his neighborhood, is a coincidence. Word simply came from the archdiocese one day that a parish in Boyle Heights, one of the poorest in L.A., was without a priest. On this day, though, it seemed fitting. People beamed when they saw Boyle’s old Toyota turn up their street. Families leaned out of their houses and waved. Alone, he was a parade. Tough young men rushed to the curb to rest tattooed forearms against his open window. “Mijo!” Boyle greeted them, slapping hands and bumping fists. Around the corner, a giant, faded mural stretched nearly half a city block. Painted a story high, beside an Aztec pyramid, were the solemn faces of César Chávez, Martin Luther King Jr., and Emiliano Zapata, and a smiling Gregory Boyle. 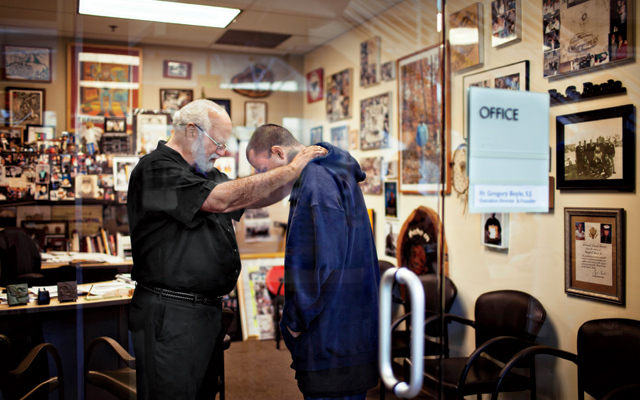 By 2010, Homeboy was the country’s largest gang-intervention program, employing hundreds of felons–Boyle calls them his “homies”–at a cafe, a silk-screen shop, and other small businesses, and offering services such as free tattoo removal, GED classes, and counseling to thousands more. Boyle had become famous, even by Los Angeles standards. (Periodically, tourists will peer into his office and snap his picture, or ask him to sign a copy of his 2010 best-selling book, Tattoos on the Heart: The Power of Boundless Compassion.) Still, he remained Father G, addressing his employees as “son” and “kiddo,” “dawg” and “mijo,” and marrying them, and baptizing their children–and, sometimes, burying them. He stayed in the same room in Boyle Heights, a converted garage of a Jesuit group house, with just enough room for a mattress on the floor and a shelf for his books. And he still gave his cell-phone number to every hard case he met. “Blow it up,” he says, and they do. Boyle describes Homeboy as a place of miracles. More than a few times, that has extended to its finances. Once, a day or two away from failing to make payroll, Boyle found an elderly woman at his door with a paper bag full of cash, thousands and thousands of dollars. In those days, Homeboy was small enough that a bag of cash could cover a shortfall. But by 2010, it had an operating budget of nearly $10 million, and its cash reserves had been dwindling for months. On a Thursday just after lunch, two years ago this month, employees filled Homeboy’s lobby, and the stairway, and peered down over the railing from the second floor. They grew quiet. Boyle told them that Homeboy was out of money. Most of them were going to lose their jobs. And he wept. Bruce Karatz read about those layoffs in the paper. He was at his weekend home in Malibu, with his wife, Lilly Tartikoff, the widow of former NBC Entertainment president Brandon Tartikoff. (Karatz’s previous wife, his second, was Sandra Lee, the Food Network personality.) Karatz had plenty of time to read the paper. Too much time, for his liking. Three weeks earlier, a jury had found him guilty of four felonies. It was possible the judge would sentence him only to parole. It was also possible that, at 64, he could spend the rest of his life in federal prison. He would not know for months. From 1986 to 2006, Karatz was CEO of KB Home, cofounded in the 1950s by a young accountant named Eli Broad. Karatz grew Broad’s first company into one of the world’s largest home builders. During Karatz’s time at the helm, KB Home increased home sales by nearly 1,000%, bringing in $9.4 billion in revenue in 2005, his last full year as CEO. For his efforts, Karatz paid himself a staggering amount. 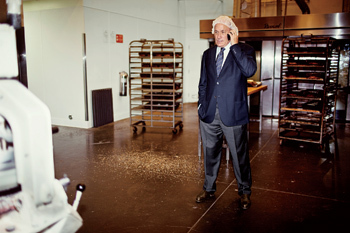 In his final year at KB Home, he made, by Forbes‘s count, $135.53 million. Then came the investigation. In 2006, the Securities and Exchange Commission began to crack down on the practice of backdating stock options. Karatz’s board found irregularities with stock transfers he’d authorized, worth roughly $36 million. He was fired, and the SEC opened a criminal investigation. Ultimately, in April of 2010, a jury cleared him of intentionally manipulating stocks but found him guilty of obscuring the accounting, a felony. Karatz had never thought much about incarceration, until recently, or about gangs. But he was a businessman, and he was anxious for something to do, something to keep him from dwelling on his future. Oddly enough, he had plans to meet Riordan later that morning for a bike ride up the coast. The next day, Carol Biondi’s cell phone rang. Biondi, a longtime Homeboy board member and the wife of Frank Biondi, the former Viacom CEO, was in a Las Vegas boutique, shopping with Edythe Broad, Eli’s wife. It was the former mayor calling. He wanted to introduce Karatz to Homeboy. I paid a visit to Homeboy last summer. Sunlight filled the lobby. Dozens of young men, and some women, sat in rows or loitered outside. Most were garishly tattooed. Boyle appeared, and the men gathered around him, three or four deep, for a hug, or a whispered blessing: “You are exactly what God had in mind when he made you.” Karatz sat nearby, thumbing at his BlackBerry, in trim gray jeans and a dark sport coat. He had been coming in pretty much every day now, for more than a year. Karatz and a small group of social workers, finance people, and supervisor-level homies piled into Boyle’s office for a meeting. One of the supervisors, Kyle Shoaf, had called to say that he’d be late. His car had been towed, which was an especially big deal because he’d been living in it, a fact that shocked everyone. Conversation turned to a woman whom conversation often turned to. She is unstable and, years ago, had failed to hold a Homeboy job, but still, she showed up most days. A few months earlier, she had charged one of Boyle’s supervisors with a baseball bat–a boulder of a man who brushed off the incident, as did Boyle, who figured if she was actually looking to hurt someone, she would have picked a softer target. Then, yesterday, she had punched the receptionist in the face. This was more serious. “Her lady left her, and she’s sad,” Boyle said, sympathetically. Most of the violence he sees, he chalks up to hurt and depression. There was also business to discuss. A large foundation, the California Endowment, was planning to convert an old hospital building into a community center and offered Boyle the industrial kitchen–a 35,000-square-foot space, larger than Homeboy’s entire headquarters. “But to do what?” Karatz asked. “Well . . .” Boyle said. “A year from now,” Boyle said. “But where will the revenue come from?” Karatz said. “And that is the spirit that built Homeboy,” Karatz said. Everyone laughed. “It has brought us to the brink many times,” Boyle admitted. Back in the summer of 2010, during the first few weeks after the layoffs, Homeboy’s normally teeming lobby had been quiet. Word had gotten out that Homeboy had no jobs to offer. If Boyle ever doubted what made Homeboy work, that empty lobby settled it for him. People hope for jobs, and that hope lures them in. But hope expires quickly in Boyle’s experience; without encouragement, people return to the life they know. He had to start hiring again. Boyle, Karatz, and a few Homeboy board members met with their largest donors, who were deeply unsettled that a grantee of Homeboy’s stature could be so close to insolvency. (“I put Father Greg in the category of two or three supremely magical people I’ve met in my life,” said Robert K. Ross, the California Endowment’s president.) But once they began to look at Homeboy’s numbers, the crisis made sense. Homeboy raised $6.8 million in 2009, but it spent $11.3 million, and was on pace to spend more in 2010. Even with a little more than $2 million a year in business revenue, Homeboy was operating at around a $2 million deficit. The woman who punched the receptionist had returned. Alone with Boyle in his office, she paced frantically. “I didn’t touch nobody!” she shouted. Typically, people crowd Boyle’s door, hoping to catch his eye and steal a moment with him, but everyone kept their distance. Karatz put his jacket over his shoulder, slid on a pair of big designer sunglasses, and stepped out to check on a new Homeboy business down the street. Boyle found Karatz a desk alongside three fundraisers in the tiny, crowded development office. (They later moved him to a nearby cubicle. “He was reeeaaally loud on the phone,” one of the women said.) Homeboy’s foundation funders seemed ready to offer a bailout. Karatz helped draft a basic financial plan–mostly, cutting Homeboy’s payroll and services to a level of funding it could reasonably expect to raise–and hustled for donations from friends and acquaintances. He also pushed, successfully, for a new chief financial officer, one with a finance background. The large supermarket chain Ralph’s had invited Homegirl Cafe to sell its salsa in the deli section of a downtown store. The store sold out every morning, and Ralph’s was interested in taking the salsa into other stores, but the conversation had stalled. Karatz called Ralph’s and said he wanted to develop labels and packaging and push Homeboy Salsa into every Ralph’s in the region. He wanted more flavors, too, and a line of tortilla chips. Karatz spotted another opportunity in a request for proposal from the city. For years, a tiny, dilapidated coffee business on the second floor of City Hall had been the only shop in the building. It was closing, and the city wanted a new vendor. “To have Homeboy as the only place to eat at City Hall, all the movers and shakers walking by, on their way to meet the mayor,” Karatz said, “I thought, This is very cool.” Homegirl Cafe could stock it each morning with premade sandwiches. It would be a simple, straightforward business. Karatz got a well-known local architect, Mark Rios, to agree to design the space. But he still needed to find around $400,000 to get the shop built and open, and Homeboy wasn’t in any position to borrow. A few weeks later, he was at his desk when one of Homeboy’s fundraisers, a few feet away, hung up the phone. Someone named Jesse Bonderman had just donated $5,000 to pay for holiday turkeys and gifts. “No. But there’s a guy named David Bonderman who is a founding partner of TPG, one of the world’s largest private-equity firms.” He asked for the phone number. “Lo and behold, it’s David Bonderman’s son. I told him, ‘I have a big idea for you,’ ” Karatz said. A few days later, Jesse Bonderman donated $400,000. Homeboy Diner opened last June. “Bruce!” said a heavily tattooed guy behind the register at the diner, as Karatz approached. The space looks like a national chain, with black-and-white photographs of homies framed against lime-green walls, printed with a repeating Homeboy logo. Homeboy chips and salsa are on display. This was something new for Homeboy, building new business lines as an actual business would. And Karatz saw opportunities everywhere. Before he arrived, Homeboy agreed to license its name to a concession company that was bidding to open restaurants at Los Angeles International Airport. The company proposed some sort of Homeboy eatery in exchange for a donation and a share of revenue. Boyle was grateful for the revenue, but Karatz got excited about the business. 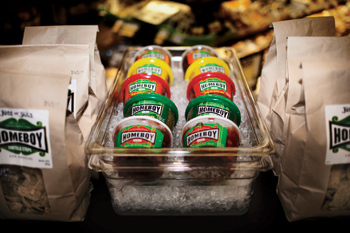 He pushed for display cases to advertise Homeboy’s grocery line, merchandise sales, and design features that could market Homeboy’s mission to the millions of people who walk by. The restaurant will open this summer. He has also been in conversations with Harry Morton, owner of the Viper Room and the son of Hard Rock Cafe cofounder Peter Morton, to bankroll a Homeboy bar and grill in Hollywood, near the ArcLight Theater. He hired a director of businesses, who has pitched a second Homeboy Diner and bid to take over the cafeteria in a large government building. And he developed prototypes for three flavors of Homeboy salad dressing. Not everything has worked. Karatz struggled to get better results from Homeboy’s bakery, which he identified as their most challenging small business. He has eased back on plans to take Homeboy’s grocery line national. And steep shelving fees have halted, for now, his plans to introduce salad dressing. Still, according to Karatz, proceeds from licensing the chips and salsa are on pace to net the organization $500,000 this year. On every sign and every label: jobs not jails. When Karatz received his sentence in November 2010, some people wondered if his months at Homeboy had bought leniency. “It was smart for him, and it was smart for us,” concedes Boyle’s deputy, a former homie named Hector Verdugo. But the judge’s sentencing statement emphasized that Karatz had not caused shareholders or the company to lose money, and that Karatz himself had lost a lot–more than $175 million, between penalties, repayments, and benefits he forfeited upon his firing. The court sentenced Karatz to eight months of home confinement, five years of probation, and 2,000 hours of community service, which Boyle could supervise. Karatz’s sentence was essentially to keep working at Homeboy. In her book The New Jim Crow, Ohio State University law professor Michelle Alexander counts all the ways that felons, even those arrested for minor drug offenses, end up excluded from productive life. Depending on where they live, they can lose, forever, the right to vote, to serve on a jury, to receive professional licenses, and to qualify for food stamps and even financial aid for college. Alexander points to recent research by the National Employment Law Center that found Craigslist job postings for warehouse workers and pizza-delivery drivers that explicitly bar anyone who has committed a felony from applying. In Ohio, where Alexander lives, a felon can even be denied a barber’s license. “You should talk to Kyle,” Boyle told me. I found him in Homeboy’s crowded lobby, running interference at Boyle’s office door. Shoaf is tall and broad-shouldered, with a steady, thoughtful manner and an easy charm. He grew up on a Crip block, and got pulled in early. At 18, he was arrested for assault. He spent most of the next 10 years in and out of prison. No one thing prompted him to change. He was just tired of the life he had. But he needed a job. All day, he would look for openings and fill out applications. Each time, he would check a box, admitting that he had committed a felony. Nobody called. Finally, filling out an application to work in the deli at Ralph’s, he stared at the felony box. And he left it blank. He got the job. For a long time, he was afraid to tell his parole officer. He actually missed parole meetings, he said, because he was working, and made up excuses. Finally, he explained. His parole officer asked if his boss knew he had committed a felony, and he confessed that she didn’t. He woke up the next day angry and embarrassed. He packed up his things and left his halfway house. A few weeks later, his parole officer sent him back to jail. And he would be sent back again–for a technical violation, Shoaf said–after he began working at Homeboy in January 2010. “The day you get out, you have your job back,” Boyle told him. Soon after Shoaf returned, he earned his promotion, one of only a handful of homies to make supervisor. But he was sleeping in his car now. He had been living with his girlfriend. Then they broke up. For the first few nights, he slept on a friend’s couch while trying to save up for a security deposit for an apartment. The guy and his girlfriend, though, they argued a lot. One night, the guy put his hands on her, and Shoaf stepped between them–and the guy swung at him, and they grappled. After everyone else calmed down, Shoaf panicked. He had been sent back to prison for far less. He decided it wasn’t safe to stay with friends. So every night, after work, he drove to a Burger King parking lot, reclined his seat, and tried his best to sleep. Every morning, he stopped at a friend’s apartment just long enough to iron his shirt. One Saturday, I went with Boyle to a girls’ probation camp, for Mass. Around two dozen teenagers, wearing matching green T-shirts and black, shapeless shorts, filed into a room that looks just like a school classroom, except the bulletin boards remind the girls not to throw gang signs and to think about self-control. Boyle told a funny parable about facing fears, which involved being chased by dogs, back when he was “a new booty priest.” Then he told the story of a 19-year-old boy who showed up at Homeboy looking for $50. After some prying, the boy admitted he wanted to buy fireworks. “I’m not giving you money to buy fireworks,” Boyle told him. “Well, I guess my baby girl isn’t going to have a Fourth of July. . . .” the boy said. Boyle spoke the boy’s lines in a mopey voice. “How old is she?” Boyle asked. “Three months,” the boy said. Boyle’s teenage flock giggled. “Three months? Just wave your lighter in front of her face, she won’t know the difference!” Boyle said. The room erupted, the girls rocking in their chairs with laughter. When the boy got up to leave, Boyle gave him the money. “Go get your explosion on,” he said. Homeboy is on solid financial footing now. Its 2012 budget is roughly $14 million; about $8 million of that will come from foundations and private donors, $2 million from government contracts, and $4 million from business revenue–almost double what Homeboy’s ventures earned in 2009. Recently, Boyle promoted the finance director Karatz hired to a newly empowered COO post that will report directly to the board if Homeboy’s budget becomes precarious again. But head count is also back up to more than 380 employees. 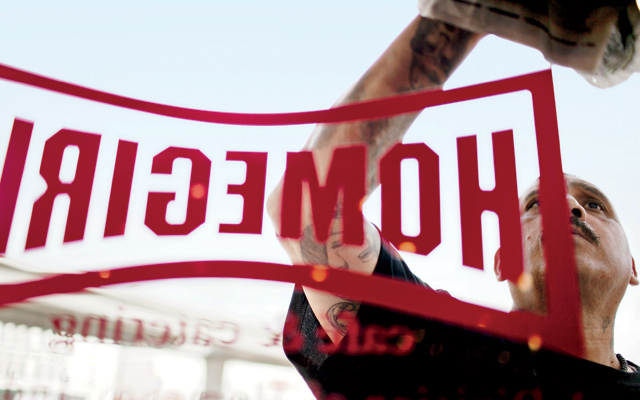 The job market has made it harder than ever for homies to graduate to regular employers, and Boyle believes Homeboy must continue to hire, so the payroll grows. It was nearly dark. There was just one person left for Boyle to see. She had been waiting for hours. Shoaf brought her in and lingered for a moment. “Can I borrow the van?” he asked sheepishly. He left with the keys, of course. Follow Douglas McGray on Twitter.